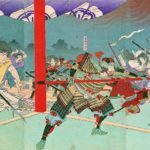 This week, we cover postwar Tokyo as it recovers from the devastation of war in remarkable time, and take some time to think about what we’ve learned from the history of Japan’s most central city. Mansfield, Steven. Tokyo: A Biography. 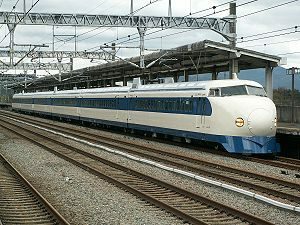 A Type 0 Shinkansen, part of the fleet that started serving the Shinkansen line in 1964. 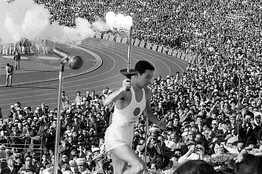 Sakai Yoshinori, 19 years old in 1964, was chosen to carry the Olympic torch as a symbol of Japan’s rebirth. Here he is headed to the Olympic flame in national stadium. 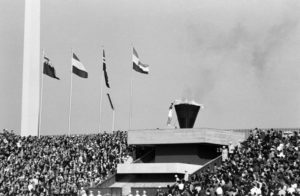 Sakai Yoshinori lighting the Olympic flame. 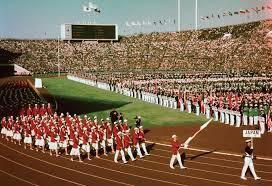 Team Japan during the opening ceremonies of the 1964 Olympics. 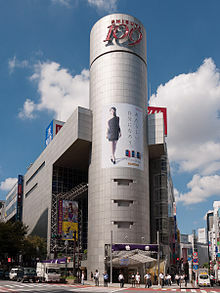 The Shibuya 109 Building, a symbol of Shibuya’s rebirth as a high-falutin’ upscale district. 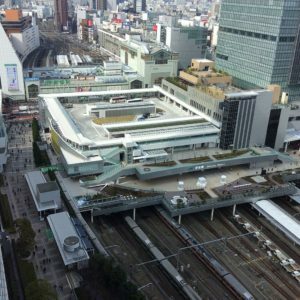 JR Shinjuku station, the world’s busiest train station on a day to day average. 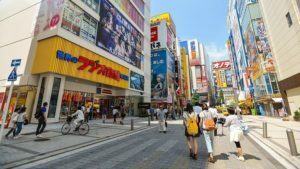 Perhaps no area better demonstrates both the continuity and change of the Shitamachi than Akihabara — once a vegetable market, and now an electronics one. Glad you brought up the transit system as that really helps to explain Tokyo’s modern development. The main reason for American and European de-urbanization was the idea, especially in the post war period, that people would drive their personal cars to and from the city; hence many cities lost or had their transit operations significantly curtailed. The replacements were these huge highways meant for high speed driving and no stopping. So how come post-war planners in Japan stuck to transit and didn’t emphasize the car? As you mentioned Tokyo expanded its subway and doubled down on heavy rail projects. The result is all the density that you see. I would think you’d really have to need a car if you wanted to own one in Tokyo today (and in my opinion crazy to want to get into that traffic!). Likewise they went in rebuilt their railroads and added the Shinkansen network whereas in the States we build Interstate Highways and more or less killed off our passenger rail networks. Anyway, thanks for this series it was really great. Maybe you could do one about the history of Japanese railroads? I think that it would work really well with your focus on local histories in Japan. Thank you for this series about Edo and Tokyo. 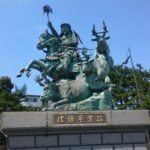 The focus on the local history of Japan’s metropolis is valuable to any gaijin who has visited the city and wondered what lies behind it. If you would return to this format in the future, may I request a series on modern Kyoto. 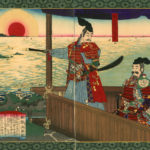 Imperial Kyoto, of course, has been the backdrop to many of your historical episodes, but I am talking about the development of the modern city, from, say, the Meiji restoration to the present. I spent a few months in Kyoto and I would like to hear the stories that lie behind the neighborhoods that I knew.